Although dripping with atmosphere and loaded with great gags, Sir, You Are Being Hunteds survival elements feel unnecessary and its stealth bores. 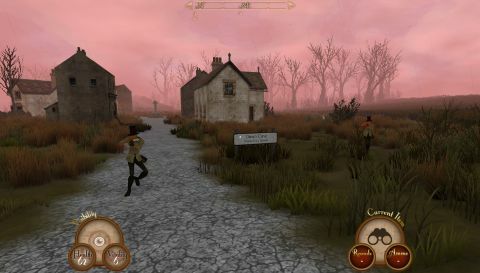 Sir, You Are Being Hunted is like being hooked up to an Earl Grey drip and bludgeoned with crumpets. It's a tut at the weather. It's a framed picture of the Queen. It's a pissed old regular at the village pub. The developers call it 'tweedpunk'. I call it 'very British'. It's to the UK what the Fallout games are to the US, and it has an utterly unique visual language. A stealth game at heart, you'll forage through spectral swathes of British countryside for mysterious fragments and bring them to a shrine. Badass robotic gentry with tweed jackets and flat caps stand in your way. Such open parameters should leave ample room for experimentation, the perfect structure in which to house a whirring, spluttering anecdote generator, but developers Big Robot don't use the space interestingly enough. This space comes in five randomly generated varieties: castle, industrial, rural, mountainous, and fenland, each sailed to by boat. Traversing these gloomy isles, as you can imagine if you've ever actually walked through a field, isn't very exciting. Endless wandering is sometimes enhanced by a stunning sight - pink sunlight streaming through gnarled branches, a family of factories belching out thick grey smoke, flocks of crows passing before a forlorn moon, dull lamplight seeping from an old farmhouse - but mostly it's thorny hedgerows, dead grass and industrial ruin. Hey, at least it captures the misery of Britain, then. But a Dear Esther-ish hiking simulator this ain't. Remember, sir, you're being hunted. It starts slow, with three or four hunters to dodge. They roam the land in small groups packing slow-firing shotguns. Soon, however, more powerful foes visit - bog creatures, robot attack dogs, headless riders on hover horses, teleporting scarecrows who can only be vanquished by staring into their glowing eyes and walking towards them. Despite this upwards curve, threat levels generally stay the same because you're always looting beefier weapons. As opponents improve, so do you. Outfoxing the AI is fun at first. In one encounter I litter the road with bear traps, then toot a trombone to bait the gentlemen machines. In another, I throw bottles to kite them down an alley then chuck in dynamite. Then I light my pipe and get dizzy drunk on stout because shut up you don't know me. As a sort of thickety sandbox in which you combine items and outwit AI, however, Sir is limited because weapons aren't interesting enough. There are four firearms, a hatchet, bear trap and dynamite, and I soon ran out of ways to combine them. You can only save at shrines, so one wrong move can wipe clean 20 minutes of progress. This is a dynamic stealth experience in which randomised enemies and locations are designed to keep players on their feet, but there's too much unpredictability, too many variables. Take the sporadic enemy patrol routes. At one point in some sombre Victorian village I was trailing a posse of robots on the opposite bank of a winding river, sure they were leaving, when without warning one spun around and spotted me, alerting his gang. I thought robot brains were meant to be logical, not liberal. Crouching behind a wall or barrel provides sanctuary, but on the downside you're, well, looking at a wall or barrel. While there are welcome stealth aids - a meter to show how visible you are, a lean button, and robots with bright red laser eyes to designate their sightlines - the best technique always boils down to crawling through grass like a tortoise, and this makes for a slow, slow game. The act of scavenging isn't enjoyable, either. Because you can't enter houses, you'll simply walk up to the door and hit F, treating it as less like accommodation and more like one big crate. In a game all about atmosphere, these churches, sheds, barns and factories sit like inert Lego blocks on the landscape. They don't feel functionally attuned to the world. Survival elements, meanwhile, are an intrusion. If you don't eat pies and cheese to keep your vitality up, you'll drop dead. You can catch rabbits and cook them by igniting log piles with matches, adding a nice degree of crafting into proceedings, but levels don't invite you to live in them, to carve out an existence. This is a game in which you're perpetually trespassing on some angry farmer's land. You need to get in, find your magical macguffins, and get out. Gags manage to mask some of Sir's flaws. Item descriptions raise a smile: the hatchet is “good for splitting logarithms,” while one village sign darkly advises us to “D i e Slowly.” Then there's the title screen option to change the game's name to Madam, You Are Being Hunted in the name of equality. Indeed, along with the darkly designed world, humour is Sir's biggest draw, from the imaginative assortment of dapper robots to the fact you can actually eat marmalade and drink flasks of tea - surely a videogame first. But Sir needed more than a strong cuppa. It needed more items, more ways to experiment with enemies, and more to ease often unforgiving stealth.